CBAC Forecaster's Blog: Digging out the details of this storm. How big was it? Digging out the details of this storm. How big was it? 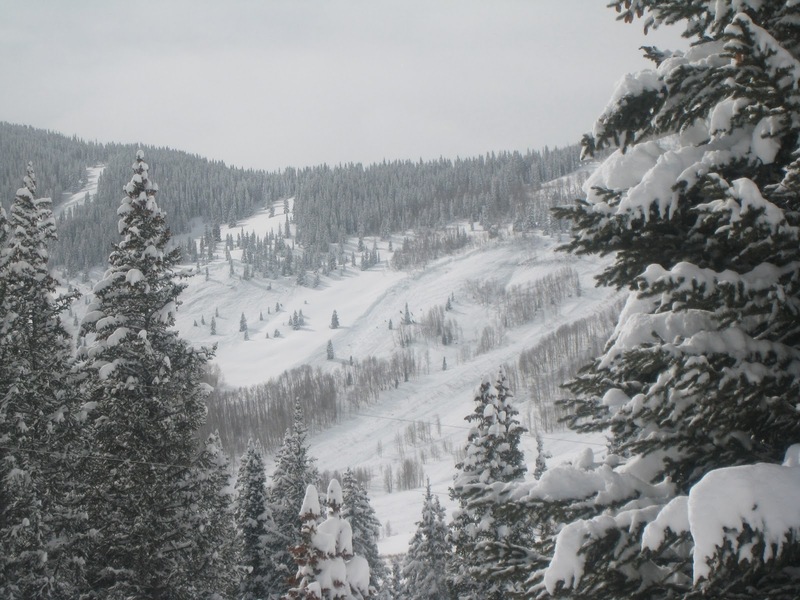 Since January 29th, the mountains around Crested Butte have been walloped by heavy snowfall. On February 10th, the storm finally cleared. My back is nearly broken from endless shoveling, my roof has avalanched at least twice, and I’ve heard lots of folks saying this is the biggest storm they’ve ever seen. How historic was this storm? The Schofield Pass SNOTEL site is a remote weather station north of Gothic Townsite that measures snow depth and snow water equivalent at hourly intervals. Snow water equivalent (SWE) is the amount of water that would melt out of the snow falling from the sky. An inch of rain measures as an inch of SWE, and a foot of snow typically produces about an inch of SWE. Between January 29th and February 10th, Schofield Pass received 9.5” of SWE. That's easily 10 feet of snow! 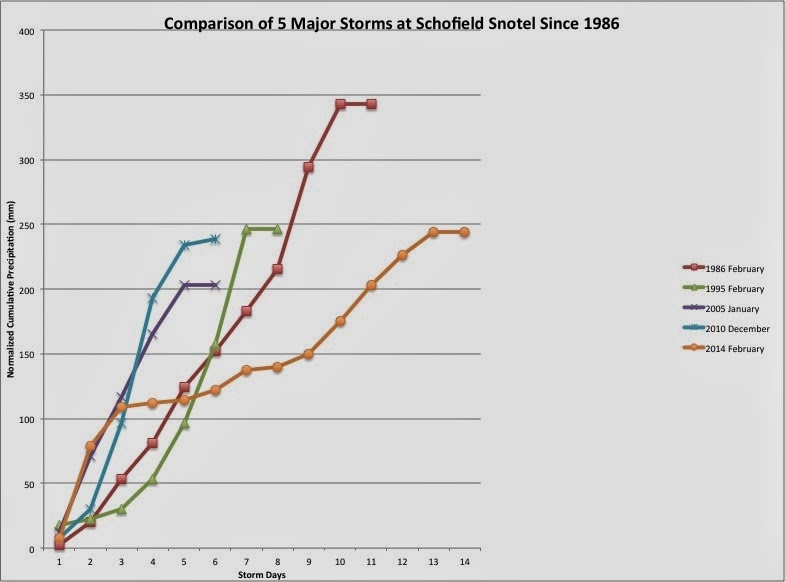 Since Schofield’s weather station was installed in 1985, four major storms stand out, with a return interval of roughly 6 years: February 1986 (13.5” SWE), February 1995 (9.7” SWE), January 2005 (8.0” SWE), and December 2010 (9.4” SWE). All of these storms came in unusually warm, with abundant moisture streaming from the Pacific. Three out of four of these storms resulted in Extreme avalanche danger, with widespread and long-running avalanches into valley bottoms. This storm, with 9.5” SWE, is comparable in precipitation levels to these previous historic storms, but it fell over nearly twice the time span. At the avalanche center, we compared our current storm to previous storm patterns to help decide whether to upgrade the danger to extreme. Extreme danger means very large and destructive avalanches are widespread; the type of danger where we might expect Red Lady Bowl to come across Kebler Pass Road. It’s a very challenging forecast when the mountains are socked in clouds and we have very few observations to work off of. During this storm, we rated the avalanche danger as high during 5 days of the storm. After the clouds cleared, we observed widespread avalanches and a dozen or more very destructive avalanches. One ran off of Gothic Mountain, crossed the East River, and buried a structure 20 feet deep! Did we hit extreme danger? I'm not sure..we were dang close. There are two reasons we didn't bump the danger to extreme on February 10th: The storm reached its maximum precipitation rate early in the storm rather than late, and it happened over a span of 13 days, while the other historic storms came in over 6 or 7 day periods. All in all, it was a memorable storm and ranks as one of the larger storms we’ve seen in the past 30 years. Whether it was at the ski resort, in the backcountry, or driving your car to work, I hope you found some of that fluffy white stuff flying in your face! Thanks to Art Mears and Ben Pritchett for their contributions to this article.